What is Occupational Therapy? What does an Occupational Therapist do? Is Sensory Processing Disorder different from “Dysfunction of Sensory Integration” or “Sensory Integration Dysfunction”? Is there more than one type of SI disorder? What is the SI treatment approach? What types of changes may I expect in my child? How is Sensory Processing Disorder treated? How can I find a doctor or dentist who is aware of Sensory Processing Issues? How can I meet other parents with Sensory Processing Disorder? Can children who have an Autistic Spectrum Disorder also have a Sensory Processing Disorder? Q: What is Occupational Therapy? What does an Occupational Therapist do? A: The goal of occupational therapy (OT) is to help children improve their ability to perform their occupations in the home environment, the community, and in school. We help children to identify, regulate, interpret, and execute appropriate physical and behavioral responses to various sensations so they can perform everyday “occupations” properly. Such occupations include: playing with friends, participating in school activities, and completing daily routines like getting dressed, using the bathroom, and knowing how to eat with a spoon, fork, and knife. OT that is specifically designed for children with sensory processing disorders (SPD) and sensory integration disorders is surprisingly fun! In fact, to the untrained observer, it looks like nothing more than child’s play. 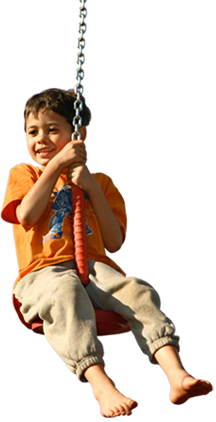 Our center has lots of toys and equipment for swinging, spinning, and climbing. We also expose children with many tactile, visual, and listening opportunities. To your child, we will appear much more like a big playground than an occupational therapy center. We are incredibly patient and understanding. We will treat you and your child with highly personalized care, concern, and respect. The goal of Focus on Kids Too is to help your child develop the automatic and appropriate responses to all kinds of sensations. This will allow your child to perform all kinds of daily occupations (activities) and social interactions. As your child becomes more competent, he or she will enjoy an increase in self-esteem and independence. You will also see improvements in self-regulation and sensorimotor abilities. Q: Is Sensory Processing Disorder different from “Dysfunction of Sensory Integration” or “Sensory Integration Dysfunction”? A: No. Sensory Processing Disorder is a new term the health care professionals are now using to describe dysfunction of sensory integration/sensory integration function. Sensory Processing Disorder or SPD is an umbrella term for several distinct forms of sensory processing issues. To listen to Rosie discuss Sensory Processing Disorders, click on the link below. To read more about the types of SPD in Defining SPD and subtypes click here. Q: What is Sensory Integration (SI)? A: Sensory integration refers to the brain’s ability to take in, process, and organize sensory input from the 7 senses, but also to combine (integrate) them together. This is how we perceive our environment and the people and physical objects in it, how we relate our body to them, as well as how they relate to each other. We are all sensory processors! Q: Is there more than one type of SI disorder? A: Yes! This is important because poorly trained therapists often present SI disorders as simply issues of sensory reactivity. This is an erroneous perception! At other times, the opposite can happen. The child may seem sluggish, unaware of sensory stimuli such as someone calling them. A bad fall that causes a bruise doesn’t make them cry; or they can spin in circles repeatedly and not feel dizzy. They may even seem to crave certain sensory experiences, like engaging in a lot of falling and crashing play. This is a type of coordination disorder where the child is unable to mentally visualize and “figure out”, or plan , new or skilled movements. People usually say the child is “clumsy.” These movements might involve large muscle actions, like learning how to roller skate or doing a cartwheel; or fine hand/finger skills for handwriting or using tools like scissors, or eating utensils. Even more significantly, Ayres found that these dyspraxic children showed an underlying pattern of impairment in the detection, organization, and discrimination of sensory information from the skin (tactile), joints and muscles (propprioception), and/or vestibular system (inner ear “equilibrium”). Her hypothesis for successful intervention was to treat the underlying sensory processing issues - not an educational process to teach the child how to execute specific movements. Q: What is the SI treatment approach? A: Often when they walk into our clinic area, parents are expecting an “exercise” physical treatment “no pain no gain” environment. That may work for adults but not for kids! Children are motivated by exploration and play. Therefore, the sensory integration treatment approach entails the use of vestibular, proprioceptive, and tactile based therapeutic activities that are combined in a playful context to motivate the child to make meaningful adaptive responses to “just right” therapeutic challenges presented by the therapist. Therapeutic goals are disguised by the artful therapist as play, thus obtaining the child’s optimal engagement. In our clinic, you will see about 2000 sq ft of cushioned floor space with an amazing array of ropes, therapeutic suspended equipment, ramps, tunnels, crash pillows, ball bath, and other child-oriented activities. However, you will also see tables, chairs, and shelves filled with cognitive, perceptual, fine motor, handwriting, and self-care activities. We also offer traditional occupational therapy work in these intervention areas, often in a developmental sequence which follows sensory-motor preparation. Q: What types of changes may I expect in my child? Increase in behavioral flexibility and cooperativeness. This may take longer and must include a home behavior management plan that works in tandem with the treatment here at Focus on Kids Too. If the child is fearful and anxious about new situations or experiences, this is reduced. Part of this style of therapy is about risk-taking, trying new activities, and doing old things in new ways. Over time, this generalizes to other situations outside of the clinic environment. Q: How is Sensory Processing Disorder treated? A: SPD is typically treated with a program of occupational therapy (OT) conducted in a sensory-rich environment. Appropriate OT can change the neurological functioning in children with SPD so they can manage their responses to sensations and behave in a more functional manner. Successful OT enables them to take part in the normal activities of childhood such as playing with friends, enjoying school, eating, dressing, and sleeping. Therapy can take place in a hospital OT department or in a private practice setting. The most effective treatment is tailored to the needs of the individual child. Q: How can I find a doctor or dentist who is aware of Sensory Processing Issues? A: The best place to start is to visit SPD Foundation and click on Find Services. It’s a one-of-a-kind online national directory of health care, educational, and community resources experienced in working with children who have SPD and other special needs. Many doctors and health care professionals have registered with the directory. Another idea is to join a support group for parents and ask for recommendations from others in the group. See SPD Foundation's For Our Families for a list of support groups across the country and in some international locations. Q: How can I meet other parents with Sensory Processing Disorder? A: For Our Families, sponsored by the SPD Foundation, is a network of local support groups for parents from coast to coast. Check out the list of local groups. Another option is to find an online support group. Try Yahoo groups and Topica for some active listserves. You can locate groups by searching under terms such as “sensory processing,” “sensory integration,” “SPD,” or “DSI”. Q: Can children who have an Autistic Spectrum Disorder also have a Sensory Processing Disorder? To learn more about autism and Sensory Processing Disorder, visit SPD Foundation's library. You may also want to read some of Temple Grandin’s books. Dr. Grandin has a type of autism know as Asperger’s Syndrome and also has sensory and perceptual disorders. She has earned a PhD is animal science and is one of the world’s most foremost experts in the design and construction of livestock facilities. To schedule a free telephone consultation with our board-certified pediatric occupational therapists by calling us at 847-412-9772. For your added convenience, you can also fill out our online Request an Appointment form. Se habla español!